The Roman Legionary Lorica Segmentata is a replica of the body armour worn by the Roman Legions as they marched through history and built the glory that was Rome. This armour made of interlocked plates offers a superior protection. Made from 18-gauge steel, this armour is an attractive way to complete the look of a Roman soldier. Steel segments are held together by steel rivets and leather thongs. The armour can be disassembled into pieces for maintenance and care. Shoulder plates are secured by heavy duty hinges and the chest piece can be laced up using the included leather straps. Golden fittings decorate the armour and provide a regal look. 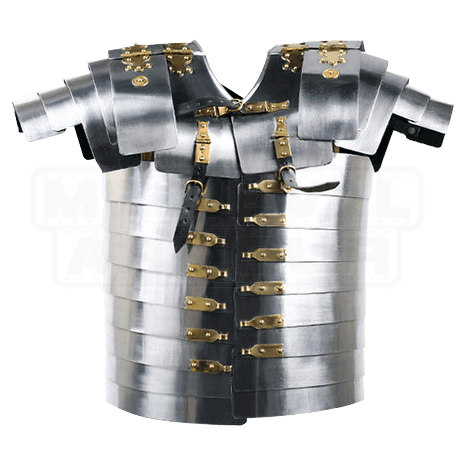 You are sure to look authentically Roman when you wear this body armour to your next reenactment. Fits between a 37 - 48 Inch Chest.